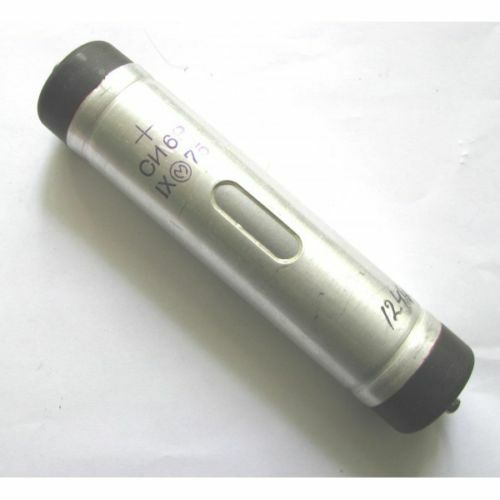 The proportional counter is a type of gaseous ionization detector device used to measure particles of ionizing radiation. The key feature is its ability to measure the energy of incident radiation, by producing a detector output that is proportional to the radiation energy; hence the detector’s name. 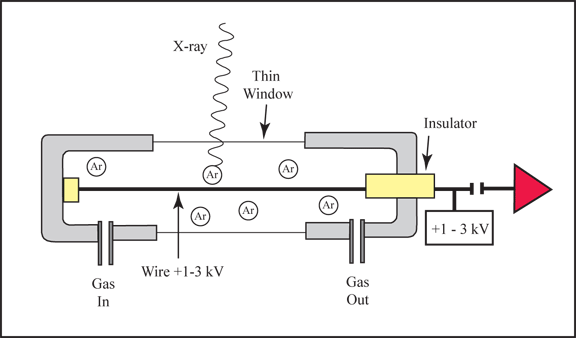 It is widely used where energy levels of incident radiation must be known, such as in the discrimination between alpha and beta particles, or accurate measurement of X-ray radiation dose. A proportional counter uses a combination of the mechanisms of a Geiger–Müller tube and an ionization chamber, and operates in an intermediate voltage region between these. The accompanying plot shows the proportional counter operating voltage. 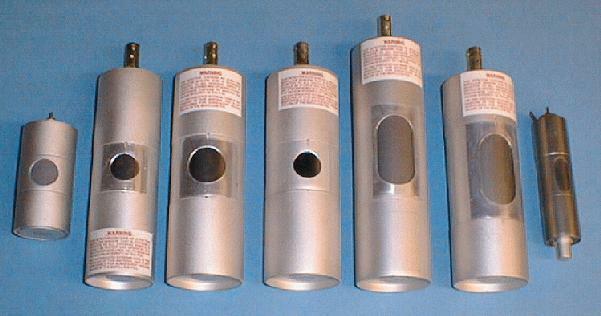 In a proportional counter the fill gas of the chamber is an inert gas which is ionized by incident radiation, and a quench gas to ensure each pulse discharge terminates; a common mixture is 90% argon, 10% methane, known as P-10. A ionizing particle entering the gas collides with an atom of the inert gas and ionizes it to produce an electron and a positively charged ion, commonly known as an “ion pair”. As the charged particle travels through the chamber it leaves a trail of ion pairs along its trajectory, the number of which is proportional to the energy of the particle if it is fully stopped within the gas. Typically a 1 MeV stopped particle will create about 30,000 ion pairs. The image below shows the basic scheme of a proportional counter. The counter is readily available in online markets, however, no other technical details or application examples could be found. 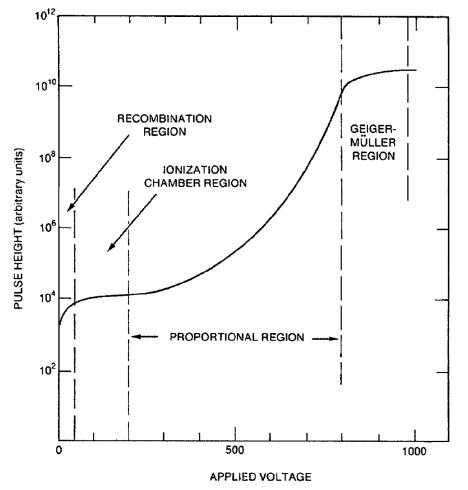 The proportional counter has a scheme of functionally quite similar to that of a normal Geiger tube, given that the working voltage is less because it works in the proportional zone and not in the discharge zone. There is a HV generator, a bias resistor and a coupling capacitor to extract the pulse. 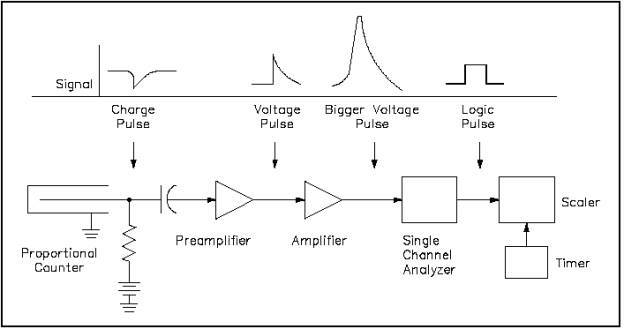 The pulse can subsequently be read out on a load resistor or it can be sent to a chain of amplification and comparison with the purpose of improving the S / N ratio and to make possible the acquisition by a digital counting system. For the characteristics of the corona tube it is appropriate to use high-value bias resistors, for example 100 MΩ. The figure shown illustrates the basic diagram. With our setup, we made measurements using as a source the Isotope Americium 241 emitting energy of 60 KeV and 26 KeV and with a tritium “keyChain” emitting low energy X-ray (bremsstrahlung radiation) around 10 KeVs. 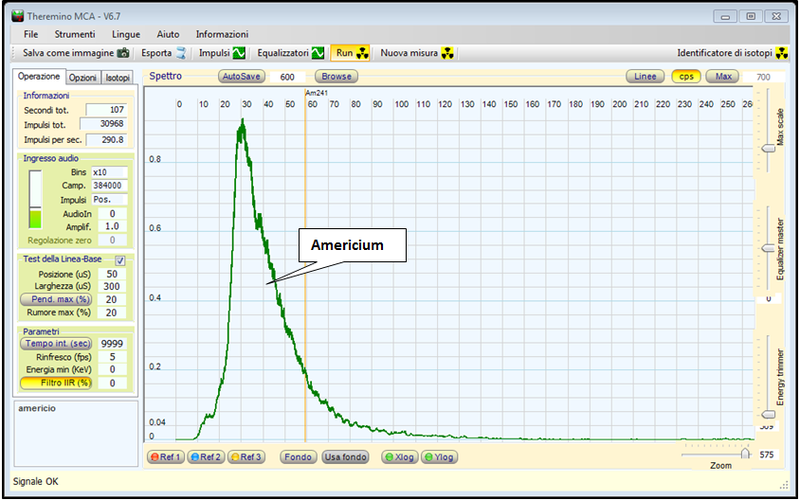 From the tests carried out we see how the energy resolution of our proposed counter is very poor. 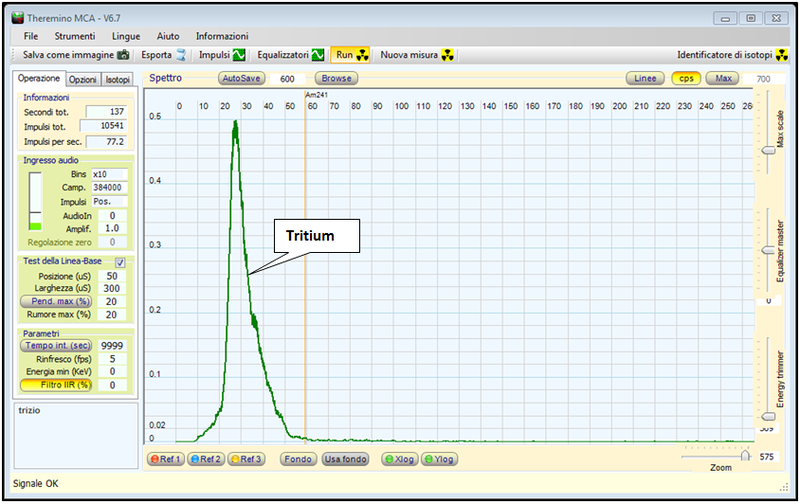 Instead its sensitivity is rather high, in fact, the low emission of tritium still records a remarkable 77 CPS. The detector is therefore particularly suitable for detecting low-energy X radiation.